Kat and Karl : elizabeth cory scheer! 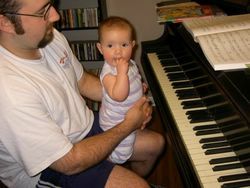 elizabeth plays piano w/ daddy-o! one of my old college roomies (from the florence house) kristen butler scheer sent me some pics of her daughter so i decided to post one i thought was particularly adorable! i mean, really, how can you not love on that!?! i have nothing exciting to blog about... the last couple of days have been quite stressful and trying... and i have been in an awful, blah mood! but things are getting better!! we head to kc with audra and mike this weekend... some of the source of my stress. audra and i had a good, honest talk last night about a lot of things.... it was good and eye-opening for both of us! Oh my goodness! How frickin cute is she!!! That's so freakin' cute, seriously. Have a great time in KC, girls! Be careful! Let's plan for Survivor night next week! Travel safely and have tons of fun! what great names! i am sad you are leaving me, but you should try and have fun without me. it will be hard but you'll manage somehow.